Recently I was heading to a big box store to pick up a Porter-Cable 6-gal air compressor but stopped into a local pawn shop first to see what they had to offer. I walked out with this cute little compressor for $25 (it is only $69 new at Home Depot or Amazon, with accessories). I figured it’ll be a nice starter compressor to run a cheap HFT brad nailer, and the price could not be beat. I could upgrade later if need be. Since I have no immediate plans to buy a framing nailer or sprayer (or anything that would require a higher volume), I think I will just stick with this for a while. I have shot about 2500 brads so far and aired up a few tires. Yes it does need to recycle often but for brad nailing workshop projects… it does just fine. It has to recycle about every 7-10 brads, but I have never had to wait for it to “catch up”. - It’s cheap! $69 including hose and accessories. - It does not “walk”. Stays in place on the lower shelf of my workbench. - It’s super lightweight and small enough to store or use anywhere. - Works great for powering a brad / finishing nailer. - Works great for inflating car tires or pneumatic tires around the house. - Builds full pressure in about 2 minutes from zero. - No tool pressure regulator (you could always add one). There is a valve to control airflow to tool, but it’s not measured. - Worthless to use for blowing sawdust out of crevices and off your workbench. You will get about 2 seconds of air before it dissipates and has to recycle… and it will not keep up. - It’s kinda loud, but not too bad. All in all, if you only need to do occasional brad nailing and tire inflation, this will be about the cheapest option you will find. If you have a need or foresee needing more capacity then look for something else. Personally I was wanting to get the 6-Gal Porter-Cable compressor from Home Depot they got for $119, which would be a perfect fit, but finding this for $25 (like new) at a pawn shop was too good to pass up. I’d say it’s even worth the full $69 retail. For $25, I’d say it was a terrific buy. Heck, for brad nailing & tire inflation, even at $69 it’s a great deal. It was obviously designed for the weekend DIY’er, so not expecting too much from it is the right way to use it. $39 new at HF, -25% off coupon. Woot, woot. I got this one from HF on sale for $99 and a 25% off on total purchase coupon about 6 months ago.Works great no waiting to recycle when cleaning up the bench or work area. I have three of them; two were free. Have to wear ear protection to use them. 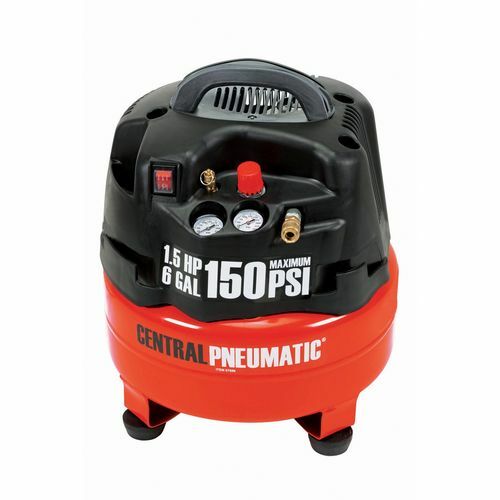 Finally went and bought a California Air compressor; super quiet. I’ve actually gotten some decent tools from HFT. This Powermate is the one I have so it’s the one I voiced my opinion on. Bogeyguy… HFT does not carry this brand, or any 1 gal air compressor from what I can find. Apples to Apples. $119 for the Porter Cable is a great deal. I have one I bought as a set with the 16 and 18 gauge nailers and think about replacing it with a Makita but the PC shoots framing nails fine and is easy to carry around. If you get the PC you wouldn’t be sorry. We have that Porter Cable AC at work for sales demos (deodorizing spray that is atomized through a custom-made applicator gun) on my recommendation. It has the minimum specs needed for the product to work and the price is right. My previous work place had one too. I was going to buy it before I saw this Powermate at that pawn shop. I still can’t get over how well it works for my present needs.